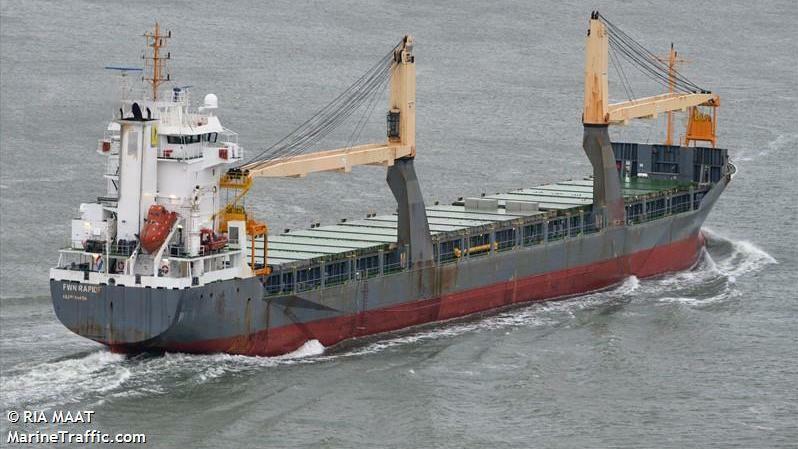 Suspected Pirates Board Dutch Cargo Ship Off Nigeria, Seize Crew : The Two-Way Twelve crewmembers of the MV FWN Rapide were reportedly taken hostage over the weekend. The ship's manager says it is working to gain their release. MV FWN Rapide shown in a photo from the website MarineTraffic.com. The vessel was reportedly attacked by suspected pirates over the weekend and most of its crew kidnapped. Suspected pirates have seized 12 crewmembers of a Dutch-flagged cargo ship off the coast of Nigeria, the vessel's managing company confirmed Monday. The 480-foot MV FWN Rapide was attacked on Saturday morning as it was approaching Port Harcourt, Nigeria, according to gCaptain, an industry website. According to the ship's Automatic Identification System (AIS) tracking, it was bound from Takoradi, Ghana, to Bonny Island, Nigeria, at the time of the attack, gCaptain says. The ship's manager, ForestWave, issued a statement Monday saying its "main priority is to establish contact with the missing seafarers and secure their earliest and secure return." "The company's Emergency Response team is working around the clock and is liaising with the local and international authorities," the statement said. "We are currently in close contact with the authorities and taking professional advice in order to secure the earliest release of those that are currently being held," the statement read. "Together with our local representatives in the countries of origin of our valued seafarers we are keeping the families of the FWN Rapide crew informed about the situation." Two crewmembers were left aboard and are reported safe. ForestWave lauded them for their "courageous and professional handling" of the vessel following the attack, crediting them with moving the vessel to a safe location. Piracy off the Horn of Africa, made famous in part by the Hollywood film Captain Phillips, starring Tom Hanks, has largely shifted to West Coast of Africa, particularly Nigeria, which has been an on again, off-again hotspot. In 2013, Nigerian pirates seized the U.S.-flagged C-Retriever, a 222-foot offshore resupply vessel, holding two of its crew for a month.